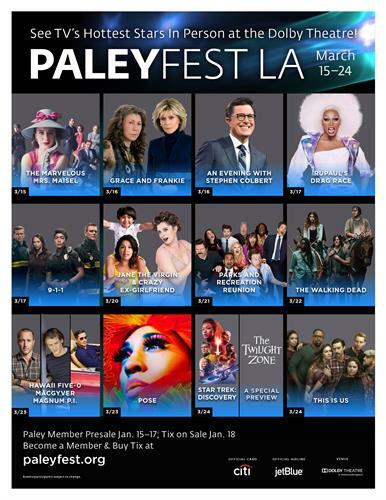 This year’s PaleyFest will open with the cast and creative team from Amazon Prime Video’s The Marvelous Mrs. Maisel (March 15 at 7:30 pm) followed by Netflix’s Grace and Frankie (March 16 at 2:00 pm); CBS’s An Evening with Stephen Colbert (March 16 at 7:00 pm); VH1’s RuPaul’s Drag Race (March 17 at 2:00 pm); FOX’s 9-1-1 (March 17 at 7:00 pm); CW’s Jane The Virgin and Crazy Ex-Girlfriend: The Farewell Seasons (March 20 at 7:30 pm – two-panel event); NBC’s Parks and Recreation 10th Anniversary Reunion (March 21 at 7:30 pm); AMC’s The Walking Dead (March 22 at 7:30 pm); Casts of CBS’s Hawaii Five-0, MacGyver, and Magnum P.I. (March 23 at 2:00 pm); FX’s Pose (March 23 at 7:00 pm); CBS All Access’s Star Trek: Discovery and its upcoming reimagining of The Twilight Zone from executive producers Jordan Peele and Simon Kinberg (March 24 at 2:00 pm – two-panel event); and the festival will close with NBC’s This Is Us (March 24 at 7:00 pm). 9-1-1 (March 17 at 7:00 pm); Jane The Virgin and Crazy Ex-Girlfriend: The Farewell Seasons (March 20 at 7:30 pm – two-panel event); NBC’s Parks and Recreation 10th Anniversary Reunion (March 21 at 7:30 pm); The Walking Dead (March 22 at 7:30 pm); Hawaii Five-0, MacGyver, and Magnum P.I. (March 23 at 2:00 pm); Pose (March 23 at 7:00 pm); Star Trek: Discovery and The Twilight Zone (March 24 at 2:00 pm – two-panel event); and This Is Us (March 24 at 7:00 pm).